DENNIS KOWAL ARCHITECTS designed this new health care facility in the village of asaya, Nicaragua outside of the capital city of Managua using strategies for resilient design. This approach allows the facility to function without electricity while relying on natural building systems. 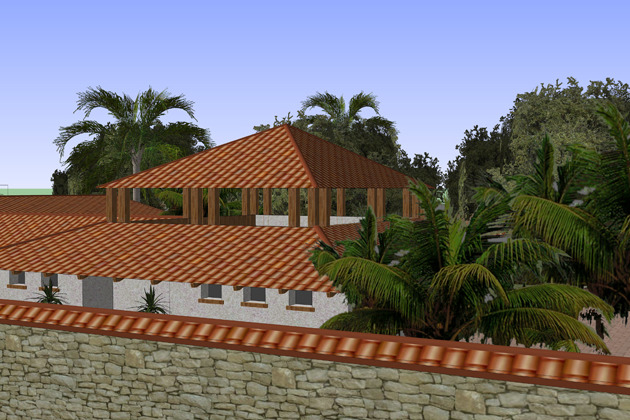 Designing a new healthcare facility in Nicaragua is much different than in the United States. But the US can learn lessons from a third world country where electric is spotty, contamination is likely, and water is untreated. When a disaster like Superstorm Sandy strands eleven States without power, many US healthcare facilities like the NYU Medical Center were crippled and couldn’t function. However, Dennis Kowal Architects (DKA) applied the principals of “resilient” architecture to their healthcare facility design in Managua, Nicaragua. Since power failures are common, DKA designed the facility to use natural ventilation and natural lighting. To reduce the risk of cross-contamination, another very common occurrence, DKA created outdoor waiting rooms open to the air but covered from the sun thus reducing the chance of contact and airborne contamination. The interior walls have an application of plaster that naturally contains calcium hydroxide, a mineral that resists the growth of bacteria while providing a durable and easy to clean surface. Kowal explained: “in essence, the facility takes care of itself, especially during a natural disaster”. High window openings in the exam rooms ensure privacy yet allow light and air to naturally circulate. A large covered, but open, atrium at the center of the complex creates a natural ventilation stack for all of the surrounding rooms. The atrium brings light and air into the rooms that ring the courtyard and simultaneously creates an outdoor waiting room. A landscaped courtyard surrounds the facility to allow the families a place to play while a family member is receiving treatment; at night the same wall provides security. Some of the children that have been treated by the doctors of Caring Partners International using temporary facilities, pose for the camera. Others may walk all night (as did this woman assisted by her grand-daughter) to get to a care center. Existing conditions can be dirty, dusty and contaminated by animal waste and garbage dumps. Ubiquitous volcanic ash often covers the village in dust (see photo of girl in dress). The new medical facility provides a clean, healthy, and resilient environment as well as a model of sanitation for the villagers to follow. Planning the healthcare facility on-site in Nicaragua is only the first step in a master plan for a new village. Dennis Kowal Architects met with local doctors to select the site, visited with the mayor to solidify support and caucused with nurses and staff to design the facility. Local Architectural student, Maria, helped with translation of the complex medical and architectural terms. Since the site is near an active volcano, resistance to earthquake forces factors into all of the reinforced concrete construction in the area. DKA worked with local architects to assess the building materials, climate, and standards of construction. A low impact design was desired that could operate during a disaster. Above, Maria (a student of architecture) was also a translator for Dennis Kowal Architects as they interviewed the doctors and patients to design a facility that would meet their needs but also provide a resilient design. While many developed countries are still reeling from the many natural disasters that have occurred, lessons can be learned from our third world neighbors who daily face a world without power, public transportation, or central air conditioning. Beyond sustainable design which minimizes the impact on the environment, DKA understands the simple principals of natural systems that can adapt and survive during periods of stress, loss and disaster.